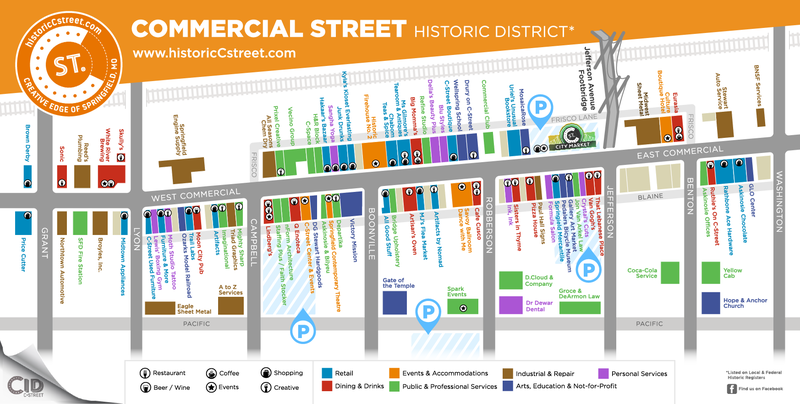 The Commercial Street Community Improvement District was established in 2009, its first board of directors established as of August 14, 2009. The life of the CID is 10 years and will expire on June 15, 2019. The Commercial Street CID operates with funds generated through private donation as well as a supplemental CID sales tax that was voted into effect by registered voters in the CID district in March of 2010. The CID sales tax of 3/8% approved in March of 2010 will expire on March 31, 2019. The creation of information and image enhancement, such as maintaining a website, publishing visitor guides and maps, installing and maintaining street furniture and banners on public ways, as well as additional marketing services approved by the Board. The recruitment of new businesses to the District and the support in the retention of existing businesses in the District. The provision for a shuttle or other forms of public transportation to link the District with other Center City activities. The installation and maintenance of holiday lighting and decorations. The cleaning and maintenance of public sidewalks, alleys and parking lots, landscaping, and snow removal on snow routes as needed. The removal of trash from public sidewalk receptacles. The provision for supplemental police patrols to enhance the safety and security of the district. The administrative services and personnel (contracted and/or hired employees) necessary to manage the District as approved by the Board.